Burlington County Freeholder Deputy Director Bruce Garganio today announced a special “Home for the Holidays” promotion that will offer free pet adoptions to approved adopters through the month of December at the Burlington County Animal Shelter. With the shelter nearing capacity, staff and volunteers are working harder than ever to find homes for the animals. 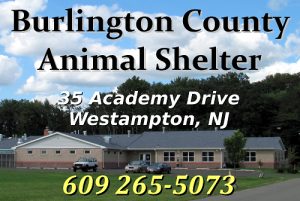 The County Animal Shelter is located on Academy Drive off of Woodlane Road, behind the Burlington County Library in Westampton Township. Hours of operation are noon to 7 p.m. on Mondays and Thursdays; noon to 4 p.m. on Tuesdays, Wednesdays and Fridays, and noon to 4 p.m. on Saturdays. The shelter is closed on Sundays and holidays. For more information, call the County Animal Shelter at (609) 265–5073, visit co.burlington.nj.us/animalshelter, or ‘like’ the County on Facebook @BurlingtonCounty or on Twitter @BurlCoNJ.